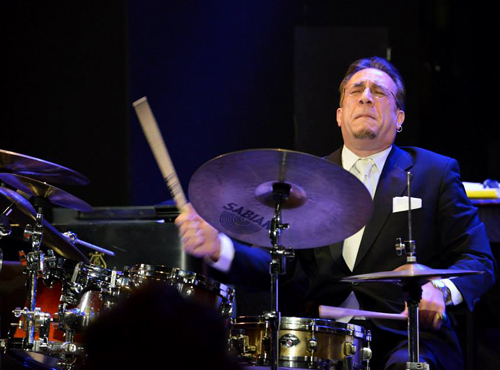 Bobby Sanabria leading the Multiverse Big Band at Dizzy´s Club Coca-Cola. Bobby Sanabria was born of Puerto Rican parents in the Bronx, New York, in 1957, the year West Side Story debuted on Broadway. He saw the film version years later, as a young man, with his parents and his sister, and in Leonard Bernstein’s musical setting of Shakespeare’s Romeo and Juliet in mid-50s New York City, he heard something familiar yet also oddly new. Of course, West Side Story is also a story about gangs in New York (“How could it not, it was an undeniable reality,” acknowledges Sanabria in the essay) but Sanabria saw more than that. “It’s a complex story of romance set in the energy of the inner city amidst racism, bigotry, territorial imperative, and what causes it — fear and ignorance that’s offset by cultural pride, humor, and the spirit of fighting for what one believes in,” he writes. Leading his 21-piece Multiverse Big Band and featuring the writing of nine arrangers, in West Side Story Reimagined (Jazzheads), Sanabria expands and updates nearly all of Bernstein’s charts. Mirroring the original, it is an ambitious musical piece that also bears witness of the times. “Gee, Officer Krupke,” a comic relief number in the original, now it also suggests a meditation on 60 years of change. “What does he see? How does he feel about the people in the neighborhood?” asked Sanabria. “How do you express that in an arrangement? Well, you express it through all these different rhythms: the [Afro-Puertorican] bomba yuba, bomba sica, Haitian kompa, New Orleans second line, and even a waltz, representing the European culture present.” The climactic “The Rumble/Rumba” is played to a bomba yuba before it explodes into an appropriately violent rumba. “Maria,” one of the most memorable songs in the show, opens now with drumming and chanting to Ochun, the deity of love in Afro-Cuban Santeria religion; while “Tonight” becomes a lush bolero that turns into a samba — before is Dominicanized into a merengue. West Side Story Reimagined was recorded live at Dizzy’s Club Coca-Cola at Jazz at Lincoln Center last November. Part of the proceeds from the sale of the double CD set will go the Jazz Foundation of America’s Puerto Rico Relief Fund to, especially, help musicians who have lost homes, places to work and jobs after the devastation from hurricanes Irma and Maria. Clearly, and especially in Trump’s America, many lessons need to be taught and learned again and again, and battles long considered settled, must be re-fought. Jamie Bernstein and Bobby Sanabria discussing West Side Story Reimagined.